The Earth Day Food & Wine Festival boasts 200 environmentally friendly producers! I love our many Central Coast wine festivals that all take place around the same time, which makes it difficult to choose one over another. That’s the only reason I skipped the Earth Day Food &Wine Festival the first couple of years. But last year I finally attended and discovered I had been missing out on one heck of a great party. Not only was the green-ness of the entire event incredibly responsible, all of the great SLO County restaurants, farms, and wineries were there. And the Central Coast Vineyard Team (CCVT) who coordinates this multiple day event does a great job of partnering chefs with farms and wineries. 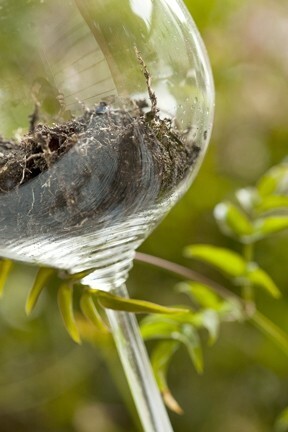 EARTH PARTY : Enjoy fine food and wine at an earth-friendly event. On Saturday the grand tasting takes place at Pomar Junction Vineyard and Winery at the junction of El Pomar and South El Pomar drives in Paso Robles. This beautiful estate features a boxcar and caboose near the tasting room in honor of a grandparent who was a Southern Pacific engineer. During the festival you’ll find many excellent restaurants, wineries, and artisan booths filling all the garden paths. You go from one great match-up of food and wine to another, and another. And should you need a break from “tasting,” you’ll find vendor booths that feature indulgences like: Artistic Woodcrafts, BeeWench Farm, Oluv Skin, Len Designs Jewelry, Stargazers Group, and much more. Among the many excellent chefs this year: Chris Kobayashi of Artisan will prepare two soups made with freshly harvested produce grown by Bill Spencer at Windrose Farm; Shaun Behrens of Luna Red is preparing beet tartare on crispy rice paper to pair with wines from Chamisal Vineyards; and Russell Thomas of Two Cooks Catering is preparing the wild boar goulash with homemade fresh herb pasta to pair with Still Waters’ wines. Sweet treats will be equally plentiful: Just Baked SLO is making salted caramel brownies; Spice of Life has pumpkin spice brownies; and Stewart & Clark Fine Foods will be roasting handcrafted marshmallows atop freshly baked graham crackers to provide s’mores. When it comes to fine wines, CCVT has connections to the best from Santa Cruz to Santa Barbara. You’ll find Carmel Road, Morgan, Paraiso, and Ridge from the north joining many of SLO County’s finest wineries, plus the freshest brews from Central Coast Brewing and Firestone Walker Brewing. Parking is limited, on a first-serve basis, and it costs $20 per car. So why not take the safe route and reserve your seats on a shuttle, sponsored by Paraiso and Shale Oak wineries, only $10 round trip. Either way, advance reservations are required. UPDATE: : In Cuisine (March 29) I recently reviewed Central City Market in Santa Maria Town Center Mall. However, last week I received notification that chef Ryan Gromfin is no longer leading the cooking team there. The mall/restaurant owner Greg Kozak has promoted sous chef Nick Nolan to executive chef. The chef plans to continue offering complimentary cooking classes on the first Monday of each month (except December). On Sunday, April 22, there are seven appealing events, among them: the “SIP and shuck” oyster and wine tasting at Tolosa; artisanal cheese and wine tasting at Derby Winery; a farm tour and lunch with Thomas Hill Organics; or a food and wine pairing vineyard tour at Halter Ranch. Prices vary, but there’s a complimentary Earth Day BYO picnic and plant sale at Windrose Farm. Be sure to wear your festival wristband and bring your wineglass which provides discounts at the passport events. You’ll get 15 percent off purchases at Novo in SLO or Robin’s Restaurant in Cambria; and many wineries will give you complimentary tasting and a 10 percent discount on purchases: Ancient Peaks, Chamisal, Changala, Clayhouse, Derby, EOS, Edward Sellers, Pithy Little Wine Co., and Poalillo. J. Lohr and Still Waters offer a 20 percent discount on purchases. The grand tasting event at Pomar Junction Vineyard & Winery begins at 2 p.m. for general admission tickets, $40 for designated drivers to $75 for those enjoying food and wine. Premiere admission tickets are $100 to $600 each, which allows those V.I.P.’s entry at 1 p.m. For tickets, a detailed schedule about this three-day weekend event, or learn more about CCVT, a non-profit organization, call 466-2288, or visit earthdayfoodandwine.com. This event strives to host a zero-waste celebration. Amazingly, last year with over 1,000 guests only 1.8 pounds of trash was generated. The sound stage was powered by the sun compliments of Pacific Energy Company. The food provided by chefs and farmers was served on recyclable and compostable bamboo dishes, bowls, forks, and spoons. Appropriate disposal containers, widely distributed at the venue, were provided by Paso Robles Waste Disposal. Volunteers manage the recycling and compost project and answer any questions guests may have.